Nafplion was the first capital of the newly independent Greece and remained thus for the next few years before being moved to Athens. It was occupied over many years by the Ottomans, the Franks and the Venetians all of whom left their traces behind. Visit the narrow Venetian style streets, the famous Bourtzi island in the centre of the harbour and the Palamidi Castle towering above the town. Nafplion has a fine array of museums with great historical items on show. The Archaeological museum, the Folklore Museum and the Military Museum. It is possible to take part in wine tasting hosted by a local company presenting wines from the area, a trip around the local ouzo factory with tasting or visit one of the towns beautiful beaches, Karathona or Arvanitia. Evenings in Nafplion are a treat with the tavernas, bars and cafeterias lining the streets and offering their wares to passers by and visitors. The nightlife in Nafplion is lively if you should choose it to be, otherwise a relaxed and happy atmosphere is apparent everywhere. Visit us at Ktima Anastasia anytime of the year! Ancient Tiryntha or Ancient Tiryns, just a few minutes from Ktima Anastasia, dates back to the Bronze Age and is famous for its amazing “Cyclopean” Walls, catacombs and tunnels. Tiryns is a World Heritage Site and is considered to be of outstanding culture interest. Tiryns was referred to by Homer in both the Iliad and the Odyssey and it is also rumoured by some to be the birthplace of Hercules. 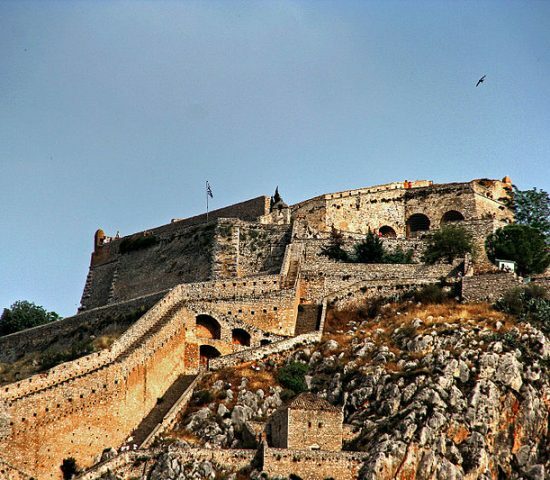 The citadel is situated on a small hill just 26m above sea level and it was a stronghold in ancient times as the sea was at that time a lot closer making it almost impregnable. Its history continued until the end of the Mycenean Era when it was deserted and in 468 BC it was destroyed by the Argives. 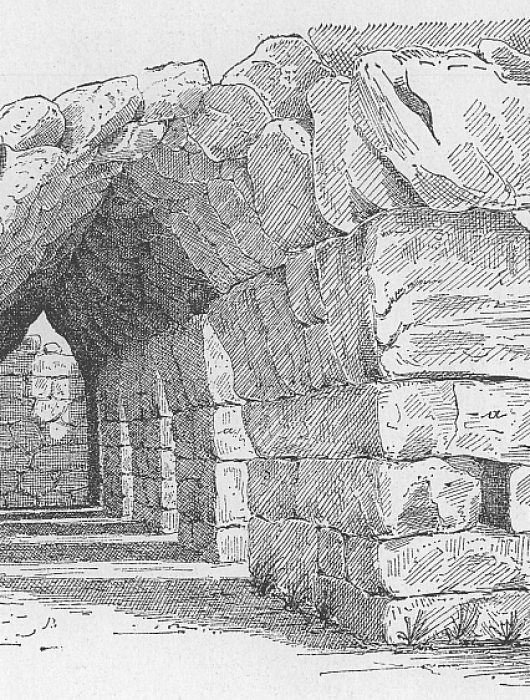 Tiryns was first excavated by Heinrich Schliemann in 1884 and until now the ruins are clearly visible of the palace, forecourts, and other areas on two levels with tunnels and drainage apparent. The walls are made of rough stones some of which are 3.5m x 1.5m, and the construction of them caused wonder in Ancient times and the myth is that only the Cyclops could have placed the stones there. An extremely worthwhile visit for anyone visiting the Argolida are also the Mycenaean Dam and the Tholos Tomb (beehive shape) of Tiryns. The modern town of Nea Tiryntha has all amenities a person could need including supermarkets, post office etc. Argos is known to be the oldest continually inhabited city in Europe and as such enjoys a great deal of visitors. It is today the commercial centre of the Argolida. There are many things to see and do in Argos including streets lined with boutiques, tavernas, restaurants & bars and every Wednesday and Saturday a large market is held offering local produce, household goods and many stalls of clothes and shoes. The archaeological museum is very interesting to see along with the ancient theatre where plays are held at intervals throughout the summer months. The Castle of Larissa high on the mountain above Argos is a beautiful spot with panoramic views of the whole area. Ideal for a picnic and in combination with the museum and theatre make an excellent day out at only 15 mins from Ktima Anastasia. 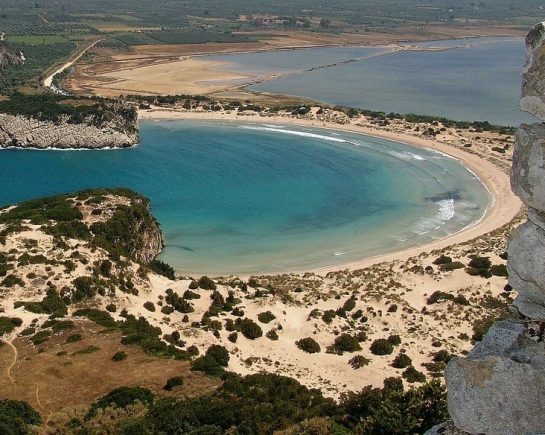 The county of the Argolida is one of the most popular holiday destinations on mainland Greece for many reasons. Close proximity to Athens and excellent roads make the journey just an hour and a half. Once passing over the Corinth Canal and into the Peloponnese peninsula one is very quickly in to the Argolida. It is easily recognisable by the hundreds of citrus trees lining the sides of the road. The Argolida area is a major producer of citrus fruits – oranges, mandarins and grapefruit. 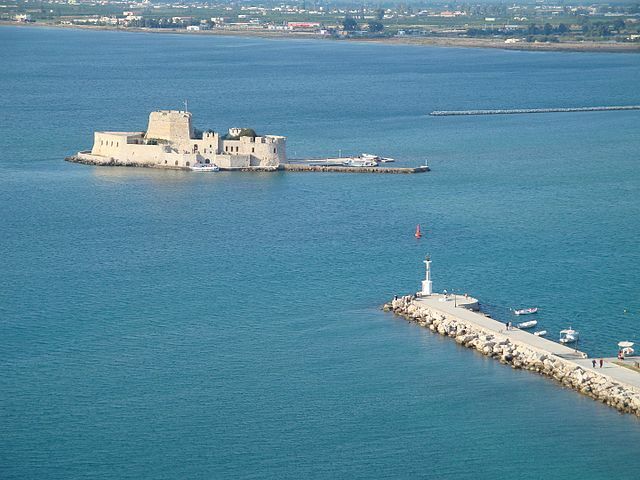 Tourists visit from all over the world using Nafplion and surrounding areas as a base from which to visit the famous archaeological sites of the Peloponnese and take advantage of the great beaches of the area. 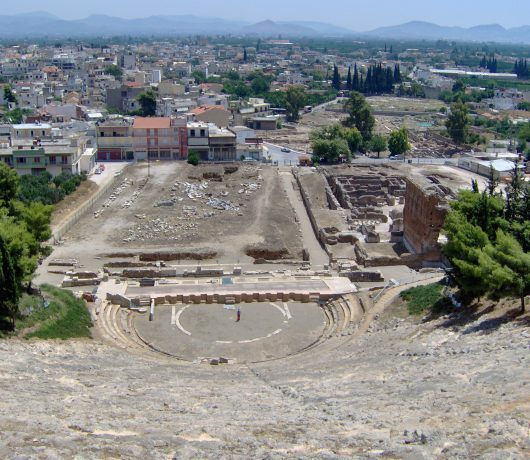 Mycenae (responsible for a whole Era), the theatre of Epidavros (which holds plays all though the summer months), Ancient Tiryntha, Midea, Lerna, Iraio and the wonderful pyramid of Ellinikon are some of the attractions of the Argolida. The Peloponnese peninsula is considered by some to be an island although, it is in fact part of the mainland of Greece, separated only by the man-made Corinth Canal. The scenery is varied around the Peloponnese, wonderful long sandy beaches and some of the highest mountainsin Greece combine to make the Peloponnese a most interesting places to visit. Add to this the wealth of archaeological sites and other places of interest and there is a winning combination. The sites of Ancient Corinth, Acrocorinth, Olympia, Mystra, Monemvasia, Sparta, Athens, Nemea are just some of the archaeological sites of the Peloponnese, for more see our Argolida section above. Apart from archaeology there are plenty of places of interest to be visited in the Peloponnese, spectacular caves, mountain retreats, ski centres and many more..